(a) Connect the vent hole connector of the instrument panel wire to the front passenger airbag assembly. 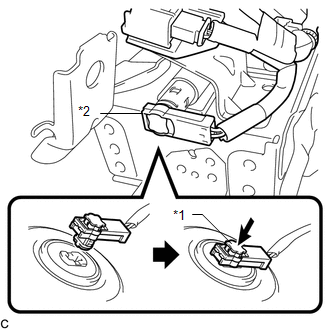 When connecting any airbag connector, take care not to damage the airbag wire harness. (b) Push in the vent hole connector lock to install the vent hole connector. (c) Connect the 2 airbag connectors of the instrument panel wire to the front passenger airbag assembly. Be sure to only connect the connectors to each corresponding color. (d) Push in the 2 airbag connector locks to install the 2 airbag connectors. (a) Engage the 5 hooks. 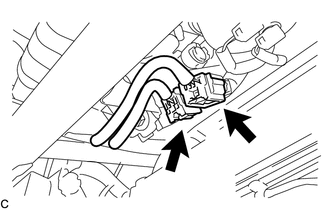 (b) Push in the front passenger airbag assembly to engage the 5 hooks. 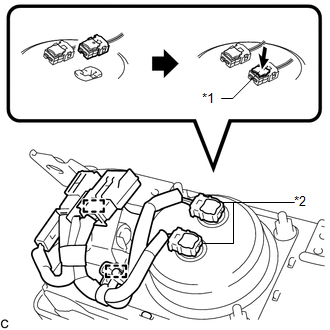 (c) Install the 2 screws to install the front passenger airbag assembly.